I live in a city of kindness. In Jerusalem, if your daughter suddenly becomes engaged and you dont have a bottle of whisky to make the customary lchaim with family and friends, dont worry, look in the phone book and call the gemach! (A gemach is a free loan organization.) Youll be able to borrow a bottle of Johnny Walker black label (could even be gold but I dont think they stretch to green or blue). Later on, just replace what you took. No charge. There are gemachs for everything under the sun. Lets say its Shabbat, the drugstores are closed and you need a certain unusual antibiotic. No problem. There are people with gemachs of medicines in their homes that rival a commercial drugstore. 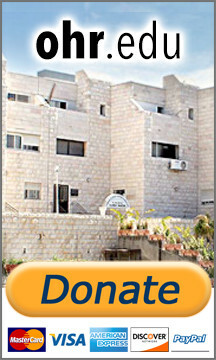 There are gemachs for clothes, chairs, cameras, tapes, tables, telephones, money, free advice hotlines, mezuzot, tefillin, bridal outfits, wigs, cooking gas cylinders, baby strollers, cribs, lactation pumps, drills, saws and other tools, embroidered cushions to bring a Jewish baby to the arms of the Sandek for his brit mila. In fact, I have a friend who has a talent for dreaming up new gemachs for people. And Jerusalem isnt alone in its kindness. Many, many cities share this distinction. We are a kind people. Its in our genes. Gemach is an acronym for Gemilut Chassadim the bestowing of loving-kindness. In Judaism you are what you do. Kindness is not a spectator sport, being kind means doing kindness. There is no word for charity in Hebrew. Look up the word for charity in the English/Hebrew dictionary and youll find the word tzedaka. Tzedaka doesnt mean charity. It means righteousness. Theres no such thing as a Robin Goodfellow in Jewish thought. We believe a person who gives charity doesnt deserve a slap on the back. Someone who doesnt give charity deserves a slap on the wrist. If you look in the written Torah, youll be hard pressed to find a single mention of the word rights. Obligations of these, the Torah is full. Look at this weeks Torah portion: obligations of a master to a slave; the obligations of a child to its parents; of a pupil to his teacher and vice versa; of a community to the poor; of the individual to the community; obligations to the orphaned, to the sick, to the convert; the obligations of man to G-d. Rights, however, are something that the Torah hardly mentions. Why? Because to the extent that I have obligations you dont need rights. You can construct a legal system that spells out peoples rights or you can write a code that lists their obligations: All men are created equal and endowed by their Creator with certain inalienable rights comes to the same thing as And these are the laws that you should put before them. The end result will be the same, but with one big difference. A system that focuses on rights breeds a nation of takers. One that focuses on obligations creates a nation of givers. Linguistic idiom reveals national character. In English, we say My duty calls. Meaning, I start off unencumbered by obligation. My obligation calls to me. I am over here and my duty is over there. If Im a good person I will heed that call. But still, my duty calls. I have to go to it. In the Holy Tongue, we talk about a person being yotzei chovotav, literally going out from his obligation. In other words, a Jew starts off by being obligated. He doesnt have to go anywhere or heed any call. Life and obligation are synonymous. When you lend money to My people. Lending money to the poor is not optional, its obligatory. What reads like an if to the rest to the world, to the people of G-d is a when.